When you’re a property manager, contractor, or builder embarking on a commercial building project there are many things to keep in mind. There are many subcontractors involved that specialize in different aspects of the building process to be sure the job gets done correctly. Gutters provide a very important function yet can be some of the last things builders think about. Properly installed rain gutters reroute rainwater and debris away from your property and safely into drainage systems. From summer downpours to winter storms, Charlotte deals with extreme weather. It’s vital for any new building project, multifamily project or commercial construction project to have professional gutter installation. ABS Insulating has been a leader in the Charlotte area for years and we look forward to partnering with you on your next commercial or multifamily building project. For more information about our gutter and insulation services, contact us today at (704) 821-4343. At ABS Insulating we work hand in hand with builders and contractors to properly install rain gutters for commercial and multifamily properties. We believe in partnering with a building team to ensure the project is done right. Regardless of the size and scope of your project, your building’s gutter system is one of the most important aspects of protecting your property from the elements. Each property is different. We pride ourselves on delivering custom rain gutters to meet the needs of any project. We don’t follow a one-size-fits-all approach. Each property has different needs drainage needs to move rainwater and debris far enough away from the property to prevent water damage. 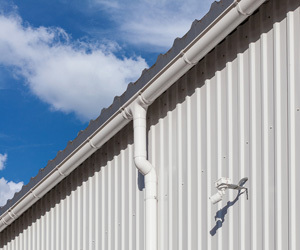 Your building’s rain gutter needs vary depending on your property’s location and the surrounding area. Our rain gutter customization options are designed to ensure our clients receive a product that gets the job done right. While rain gutters aren’t usually at the top of the list, seasoned property managers and builders know the importance of protecting a property from water damage. In addition to water and debris pooling around the building and damaging landscaping, a building without a commercial-grade gutter system runs the risk of extensive flooding and water damage to lower-lying areas of the building including a basement or parking garage. Well-designed gutter systems route water away from the property to prevent costly damages. Erosion and other serious drainage concerns aren’t just a residential worry. Commercial buildings need adequate protection from the elements, and our gutter options and installation are second to none. No matter the style or size you’re looking for, ABS Insulating has a commercial gutter system for your project. 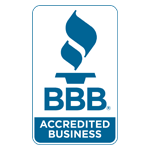 We’ve been a trusted member of the Charlotte, NC community for years and recognize the importance of providing efficient, reliable, professional, and honest service. When you’re building a new commercial or multifamily construction project, each step must be done correctly. We offer free consultations for all our commercial gutter installations so you can be sure you’re getting the right service. 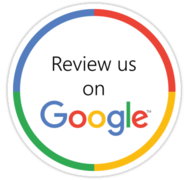 We have a tremendous level of experience and our attention to detail is unmatched. 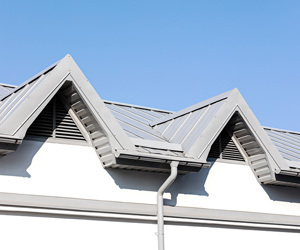 Contact the commercial gutter installation experts today!